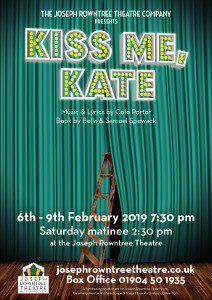 It’s time to Brush Up Your Shakespeare for Cole Porter’s ground breaking show-within-a-show, Kiss Me, Kate. Will director Fred Graham tame his fiery leading lady – and ex-wife – Lilli Vanessi? Join us for our Wunderbar fundraising show to find out. It promises to be Too Darn Hot to miss!